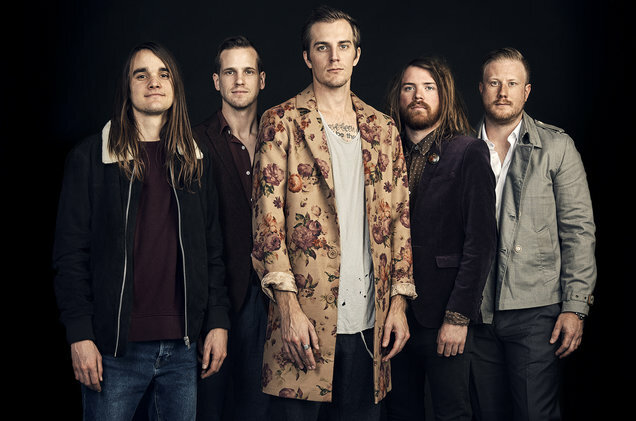 Over their twelve years together as a band, THE MAINE’s sound has been labelled many different genres by outsiders – including pop, emo, and indie-rock to name a few. The one noticeable consistency is their passion and desire to keep creating and push the realms of what is possible further and further with each new milestone. And that’s exactly what they aim to do by reinventing themselves with the release of their seventh studio album ‘You Are Ok’ , set to come out March 29th 2019. When asked about the new record, frontman John O’Callaghan states, “trying to describe sound without giving you anything to listen to is an awfully tough task, so sparing the particulars of sonics I can tell you that this record is risky. The risk lies in its urgency, its relentlessness, and its manic mood swings. Yet even inside all the taken chances there exists a familiarity that I think will be heard once you spin it”. Their last full-length self-released record, Lovely Little Lonely, that was released back in 2017, was laced with nuance and subtlety. Lovely Little Lonely premiered during its release in the Billboard Top 200 (#32) and charted in six countries on the iTunes charts (including holding a spot at #8 in the USA). idobi described their thoughts on the album with “when you have high expectations, it’s easy to be let down, unless those expectations are placed on The Maine”, which is certainly a sentiment the band hopes to hold true to You Are Ok. Back in 2017, Lovely Little Lonely was greeted with many positive reviews including from Alternative Press who said, “the result is an album that feels timeless, even on first impact. It’s The Maine’s best batch of songs since Pioneer, their catchiest material since Can’tStopWon’tStop and their most cohesive work to date”. The band retired the record and bid farewell to fans in dramatic fashion, by hosting an official album funeral complete with a red casket, before stepping into the studio to work on record number seven. This weekend, the band takes to the stage for a headlining set at their very own music festival, 8123 Fest. The jam-packed weekend invites fans from around the world into their hometown of Phoenix. Outside of the festival itself, the band will be DJing at two sold out afterparties, performing a club show with a setlist of fan’s most requested songs, hosting several volunteer events to give back to their community, running a pop up shop in the downtown core and offering all fans a free day-long meet and greet. 8123 Fest 2019 celebrates the ten year anniversary of their first full length album Can’t Stop Won’t Stop which they will perform live in its entirety for the first time at the festival. 8123 Fest features performances from Mayday Parade, We The Kings, Real Friends and many more and the festival is projected to sell out. ‘You Are Ok’ releases via 8123 on March 29th 2019. Fans can pre-order the record now, in digital form or via a physical bundle over on the band’s website. THE MAINE is – John O’Callaghan, Pat Kirch, Jared Monaco, Garrett Nickelsen, and Kennedy Brock.